does anyone have an idea for a bday gift for bmx obsessed husband - he is obsessiveley rebuilding 2 childhood bikes he got off of ebay. are there any shows coming up i can send him to? ( lots of air miles ) or books, movies that are a must have? I saw a collection of vintage bmx magazines compiled on disc on a vintage bmx site - is that good? As far as shows are concerned, there is the Rockford Nationals taking place @ Rockford, IL in June. You can visit vintagebmx.com for details. I don't think anything is current on the event for this year but, does show pics from last year. Races happen all day with special events for the Old School racers. There is also a roped off section for vintage bikes. Some of the old Pros were there last year including Harry Leary and Greg Hill! Last year was my first and what a blast! Just FYI. I am looking to put my 83 Hutch Pro Star together, and need parts. Bars, head set, cranks, rims, hubs seat and post. Anyone know where I can find. I have the Hutch Aerospeed cranks, Tange head set, chrome Araya 7X rims, straight Hutch seat post, Hutch Mag/Ti hubs, Hutch Pro Bars, and Hutch Kashimax Aero seat. I've been away from the sport so long I forgot about so many things. Looking back it was truly a great(est) BMX era for me. I would love to get my hands on one of every bike I owned. Has anyone else done the same? Im feeling the same way,, as i am looking for a Diamond back formula one any info for me anyone.??? I still have a Viper and a super viper but really want the formula one as it was my favorite,and my 10 year old son and I are going to start racing again this spring. I grew up racing B.M.X. with & against guys like John George, Dave Clinton, Bobby Encinas & Joe Franklin. This was back in 1975-1979 era. Tracks in So. Calif. were run by the N.B.A. . I believe the president was a guy named Ernie. He would use his van & a long rubber band tied from his rear-view mirror stretched across the starting line. Only @ the nationals did they have starting gates.Had some great times dicing with Dave (TEAM KAWASAKI! ), & Bobby (TEAM SHIMANO), Wonder what ever happen to those guys?. Anyway, I think its great that you & your son are riding together.Enjoy these days to their fullest!. Your son will remember them for the rest of his life. Take Care. Hey Guys, me too. I was into BMX heavy in around 80 84. Always wondered what happened to the pros like Stu Thompson, Harry Leary, Andy Patterson. if you haven't been to VintageBmx.com yet.....get there. many of the old pros and bike builders hang there and everyone is really cool. 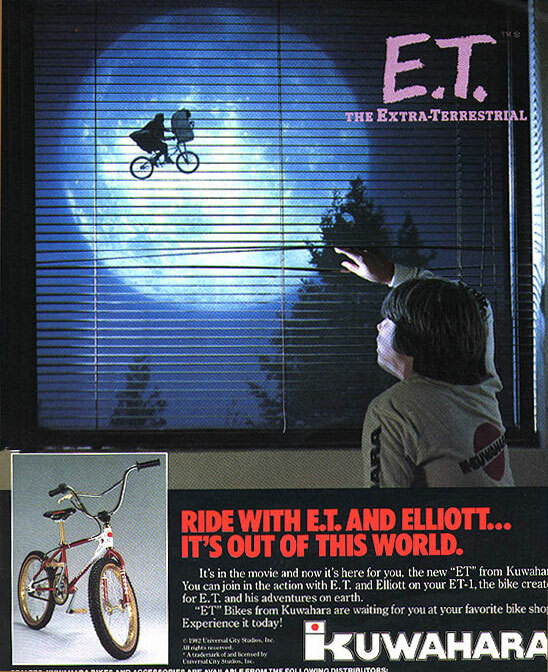 I completely forgot that was a Kuwahara in E.T. I didn't remember until I came across this ad while searhing for a Kuwahara LL3000(early mid 80's). Cool! I've got a Kuwahara ET frame and fork on ebay right now. Two and half days left. any help would be great or even just a pic. I also might have the name and maker wrong I was just a kid. Thanks Fred. i've been looking for this too! i seem to remember that it had motocross style handlebars. i really would like to find a picture! I bought this bike at a garage sale. It has a stamped serial # but also has a hand engraved one. The headtube badge says SCHUCK's and the seatpost says SCHUCK'S Seattle Wa.It has motomags with the frame that says Raceline bmx competition certified. Made in Los Angles,Ca. Any help would be great. Thank you. Vintage 20" CHROME schwinn "flite" BMX bike, just needs crank, wheels, chain and a seat and your ready to go, only $50!!!!! IT HAS TO GO!!!! own a real "old school" 80's BMX for a good price! features: 4bolt aluminum handlebar stem, 'mushroom' handle grips, original fork, and nice chrome! Hello I bought this bike some time ago and thought it was a Yamaha motobike, that someone rattle canned it 1/2 black. after some year of setting I got it out and started to clean black paint off, 1st frame #s were not correct for motobike, frame #is 5430 after cleaning most of the paint I found what was left of sticker on goose neck "monarch"
Bike has correct wheels, swing arm, shocks, handle bars, and front forks as compaired to motobike A model.differances, backbone of frame is straight. one peice crank, and orange fiberglas front and rear fenders. I need to track down a slightly used set of black 24" mag wheels and, more importantly, a pair of 24" YELLOW TIRES...I am helping a friend rebuild an early 80's AKISU HI-TEN. Anybody know where I can find this stuff? I just found my old JMC mini in my parents attic. It's at least 20 years old. How can I tell the difference between a "mini" and a "micro-mini"? Approximate value? i just saw one on ebay under oldschool bmx. if you find anyone who collects them, let me know i have a jmc DY i need to sell. The mini will have an M serial No. the Micro Mini will have an MM serial no. Also the Micro mini will have an oval toptube and down tube and the built in seatpost clamp will be 1/2 way down the seatpost tube rather then at the top. I bought this bike used when I was a kid. It has a full 4130 frame, Sugino headset and three piece crankset, SR pedals, etc. It's in great shape. I have always wondered what I really have. It's super lightweight, around 17 pounds or so. Is it rare? is this thing worth anything??? I only have the front, not the back as far as I know. the other question is I have a Vintage all chrome 20" schwinn boys BMX, I think its from the 70's or 80's, it has blue and white checkered stickers that say "flite", it has white plastic mags and an aluminim 4bolt handlebar mount, no one seems to know what it is or want to buy it so I'm ready to chop it up! what is it and is it worth anything??? for the Z rim you can probably sell it for about 30-35.00 if in great shape because most collectors can now find them failry easily just depends on where you are located. for the chrome schwinn, if its a 20" bmx bike i suggest you dont chop it up but try to place a picture of it somewhere. There is a frame (mine) listed on Ebay right now!